Om Prakash Rajbhar has a religious hymn called ‘Om Prakash Chalisa’ composed in his honour. 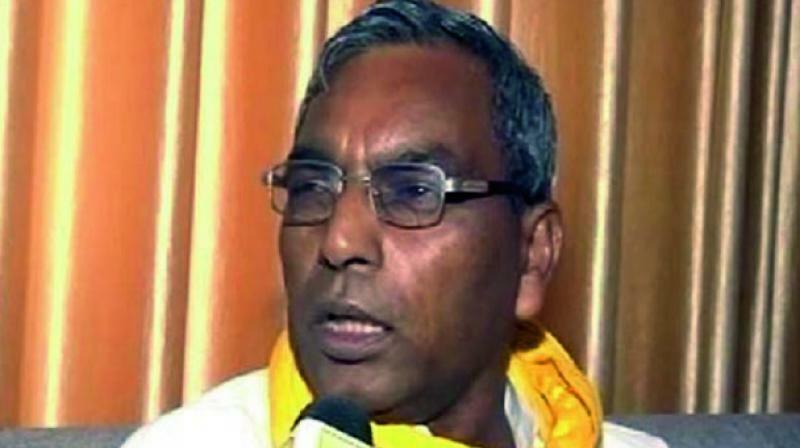 Lucknow: Uttar Pradesh minister Om Prakash Rajbhar may be known as a permanent troublemaker in political circles, but in a village in Ballia district he is revered as a deity. Om Prakash Rajbhar has a religious hymn called ‘Om Prakash Chalisa’ composed in his honour. This is sung daily by the residents of the Dharampura village in Ballia district. “Every house in this village has a photograph of the minister, and villagers pray before it daily. The village comes together once a week and offers special prayers at the local Kali temple so that he gets elevated to the position of the chief minister,” said Sanjay Rajbhar, a local resident. The villagers claim that the minister has been talking about the welfare of Other Backward Classes (OBCs), particularly the Rajbhar community and is also pressing for prohibition. “If Mr Rajbhar has his way, he will ban the sale of liquor and this will change the lives of women who suffer due to alcoholic husbands,”said Rani Devi, a housewife. She said that in times when politicians return to their constituency only when elections are near, Om Prakash Rajbhar has been regularly visiting their area even though it is not his constituency. “He has been elected from Zahoorabad in Ghazipur but Ballia remains close to his heart and we appreciate his sentiments”, she added. The minister, who is the president of the Suheldev Bhartiya Samaj Party, has been outspoken about corruption in the police and the bureaucracy and has also slammed the Yogi government for not doing enough for the OBCs.